There are several compact SUVs in the market today, and the competition is stiff. But the Nissan Rogue makes its place in the segment with its reliable performance, fuel efficiency, and comfortable interiors. Named Best-In-Class Vehicle Satisfaction Mid-Size Crossover SUV, the 2017 Rogue may have strong contenders, but does well with both build and performance. The 2017 Rogue is a five-seater compact crossover SUV available in Regular and Hybrid versions and comes in three trim levels: S, SV, and SL. The Regular version comes with a 2.5-liter four-cylinder engine that provides 170 horsepower, 175 pound-feet of torque, and is paired with a continuously variable transmission (CVT). The Hybrid version is powered by a 2.0-liter four-cylinder engine with an electric motor that gives 176 horsepower of combined output. It is available in both front- and all-wheel drive. 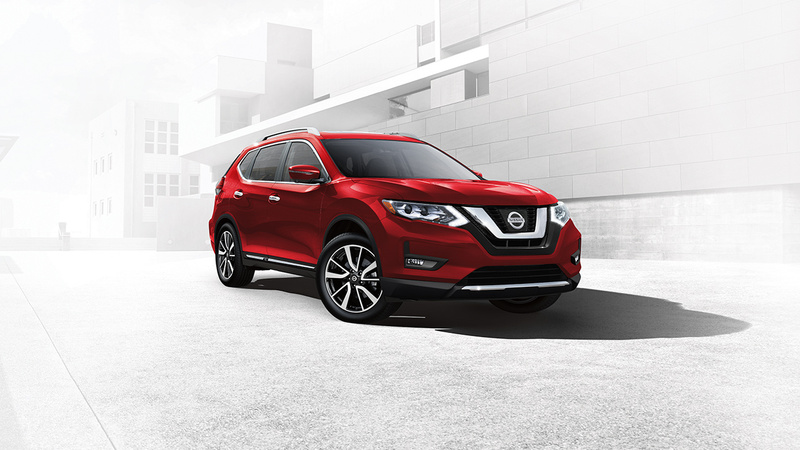 The Nissan Rogue comes with a lot of features that are unavailable on most other SUVs in the same price range, including the Toyota Rav4 and Honda CR-V. These include standard Blind Spot Warning and standard Movable Object Detection. The 2017 Rogue has gained some style refreshments and additional sound insulation. Other available additions include a hands-free liftgate, adaptive cruise control with forward collision mitigation, remote ignition, a heated steering wheel, driver seat memory functions, and a premium Platinum Reserve interior package. The classy steel exterior dazzles with aerodynamic wraparound LED taillights, signature LED Daytime Running Lights and LED headlights. Other exterior features include 19-inch aluminum-alloy wheels, heated outside mirrors, and embedded LED turn signals. The interiors are spacious, with the abundant headroom, Power Panoramic Moonroof, available quilted leather seats, available LED interior lighting, and Piano Black trim with metallic accents. With the third row, the Rouge can make room for up to seven people, and the second and third rows can be folded down to make cargo space. The 2017 Rogue does not disappoint as far as technology is concerned. Depending on the model, the available technology features include 7-inch high-resolution touchscreen, Bose® premium audio system, and Siri® Eyes. Also available are NissanConnect Services, which offer a wide selection of features, from remote door lock and unlock access on your phone to calling for help if the system senses an accident. The Nissan Rogue may be ordinary compared to higher-end SUVs, but it offers exceptional fuel economy, cargo space, and overall comfort. Even though there is stiff competition and the Rogue offers owners good value and reliability. Let New York Autobrokers serving the Oakdale and Smithtown, NY area use their 20 years of experience to get you the best lease payments or price on any car make or model of your choice. Call us at 631-446-4455 for more information!